E-commerce is increasingly leading the way in the global marketplace, taking a bigger share of world trade, creating more jobs, and pushing economic growth, also developing Asia’s economies. With the huge market acting as a magnet to brands large and small, competition will build up faster than the total growth of the market. This means customers will be harder to win, easier to lose and rigid on prices and user experience. To avoid falling behind the ever more fierce competition, there is need to be aware of and benefit from the latest trends in ecommerce. Asia is a home to 60% of the world’s population which certainly means more opportunities for innovation and growth. According to eMarketer, Asia-Pacific’s e-commerce is forecasted to have grown 31.5% in 2016, thanks to benefits from rapid technological advances, improved logistics and infrastructure and expansion of the internet, as the world’s biggest market for online sales of goods and services. And double-digit growth is forecasted through to 2020, with an expected $2.7 trillion in sales in 2020. In Asian markets, specifically China, e-commerce sales are expected to continue their huge growth. The chart below showing the predictions of ecommerce sales growth shows China driving the overall growth (almost half of the world), accounting for a huge chunk of global ec-ommerce sales. China’s growth is so rapid that total ecommerce sales there are expected to double between now and 2019, adding $1 trillion dollars’ worth of additional sales in just three years! The huge shift in e-commerce growth towards Asia has massive bifurcation for e-commerce brands. The beauty of e-commerce is you don’t necessarily need any physical infrastructure to start selling to a new country. With shipping rates cheap, international delivery becoming common and websites making borders increasingly irrelevant, it’s not as hard as it once was to break into new countries and markets. However, that should not invite complacency. Well translated websites, strategies in tune with local expectations and the use of no VAT charges to subsidize delivery costs are all of critical importance. APAC represented 40% of worldwide e-commerce business deals in Q1 2017, however, most by far of those deals went to bigger or more developed markets in the area, especially China, Japan, Australia, South Korea, and India. Two basic variables — a growing white collar class and quickly expanding Internet access — are the right indicators for quickly paced e-commerce development in Southeast Asia in the coming years: The working class populace of ASEAN — a relationship of 10 Southeast Asian countries — will achieve 400 million in 2020, up from 190 million in 2012, according to Nielsen projections. Then, internet access has been expanding at a torrid pace — 130 million individuals in the South East Asia now have cell phones. By and large, it is estimated that around 200 million individuals in Southeast Asia have some type of internet access, and that will triple to 600 million by 2025. Late research by Google and investment firm Temasek Holdings predicts that online business deals in the South East Asia will develop at a 32% CAGR from $5.5 billion in 2015 to $88 billion in 2025 when they will make up 6% of total retail deals. This guarantee of quick development has attracted China’s two e-commerce giants — Alibaba and JD.com — to investigate the startups in Southeast Asian nations. JD.com administrators as of late hinted that the organization is looking to grow topographically outside of China, and it’s supposed to be considering an investment in Indonesian e-commerce organization Tokopedia. In the meantime, Alibaba paid $1 billion a year ago for a controlling stake in Singapore-based Lazada, which claims an arrangement of mainstream online business destinations over the South East Asia. What’s more, Alibaba is working to set up a “digital free trade zone” in Malaysia and has signed a MoU with the administration there and civil experts in the Hangzhou area of China to streamline cross-border trade between the two areas. Such actions from these two business leaders are pressuring other market players like Sea Ltd., an Indonesian e-commerce once in the past known as Garena that works a noteworthy e-commerce center, as of late raised $550 million to quickly extend its business in Southeast Asia before the Chinese giants turn out to be more rooted. 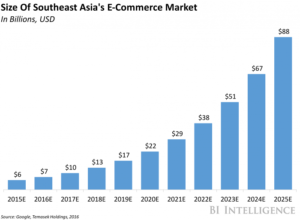 Southeast Asia is expected to achieve a double-digit growth over the next four years, with retail e-commerce sales in primary markets — Indonesia, Malaysia, the Philippines, Singapore, Thailand and Vietnam — tipped to more than double by 2020. E-commerce in Asia appears to be mainly domestic, including in China and Japan, which have very high digital buyer penetration rates, but whose online purchases are mostly geared toward local merchants. While cross-border shopping is least common in Asia, China remains the most popular online shopping destination for global shoppers, accounting for 21% of the total, while Japan accounts for 4%. As regulatory and infrastructure bottlenecks are eliminated, it is estimated that cross-border B2C e-commerce sales in Asia and the Pacific will surpass Western Europe and North America by 2020. With the region’s customers more engaged than ever in social networks and frontrunners in the adoption of mobile devices, cross-border commerce has been increasingly carried out via mobile devices such as smartphones. Mobile devices now make up over half of all web traffic and continue to grow in importance. 80 million website sessions and data related to €230 million worth of online revenue were analyzed by Wolfgang digital. They found that although mobile (phone and tablet) accounted for 59% of all sessions by device on e-commerce sites, these mobile browsers made up just 38% of revenue. Desktop was still dominating for conversion even though mobile browsing is the norm for research. The distinction was even bigger when it comes to high-cost purchases such as holidays. For online travel businesses, desktop made up just 41% of web traffic, but dominated sales, accounting for 67% of revenue. Marketers need to stop thinking of ‘mobile users’ and ‘desktop users’ as different people. Because they’re not. The average household has 7.4 internet connected devices. A ‘mobile user’ one minute is a ‘desktop user’ the next. The distinction is entirely artificial. Mobile cross-border commerce in some markets, like China and Thailand, amounts to nearly half of purchases. The growth of mobile cross-border commerce is likely to accelerate and mobile devices are said to be the “biggest game-changer” for cross-border e-commerce. E-commerce is a rapidly growing field which has to respond quickly to the latest trends. The low barriers to entry and the fact consumers can switch providers effortlessly means those that fall behind when it comes to customer experience and pricing strategy quickly loose out. Those in charge of developing e-commerce marketing strategy in 2017 should thus pay close attention to these major trends.